It might surprise y’all to learn that folks here in Seattle do not know the first thing about hair bows. Or maybe they just stay hidden underneath the hoodies. I might have caught a glimpse of one once or twice on a little girl in a fancy dress. But that may have been a dream, seeing as you hardly ever spot Seattleites of any age decked out in a festive manner. I honestly haven’t thought much about hair bows over the last couple of decades, but a trip to the Canton Flea Market brought the memories flooding back. Turns out, Southerners are still wearing them. I sort of thought they were an 80’s thing that went the way of banana clips. I guess I should have known better, seeing as my relationship with hair bows began farther back than I can remember. Fortunately, there is photographic evidence. As I’ve mentioned before, Southerners just love slapping their initials on anything even remotely decorative, so there’s an endless variety of monogrammed hair bows. From a single initial on up to all three. Plain or cursive, embroidered or painted, whatever you like. Heck, you can even put your whole name on there if your parents were considerate enough to give you one that would fit. One day, some Southern mom decided that a plain old hair bow just didn’t express the essence of Billie Sue. And so, voila! Themes! From Hello Kitty to Minnie Mouse, ponies to puppies, whatever you’re into (within reason), there’s a bow for you. Bubble gum! Lady bugs! Cupcakes! John Deere Tractors! Even skull and crossbones for the goth kids! Need I mention there’s a hair bow for every holiday candy manufacturers celebrate? Of course, there’s always somebody who takes a good thing too far. And then the million followers who come along for the ride. So now we have a whole crop of affiliation hair bows. Sororities! Alma Maters! SEC teams! TV shows! 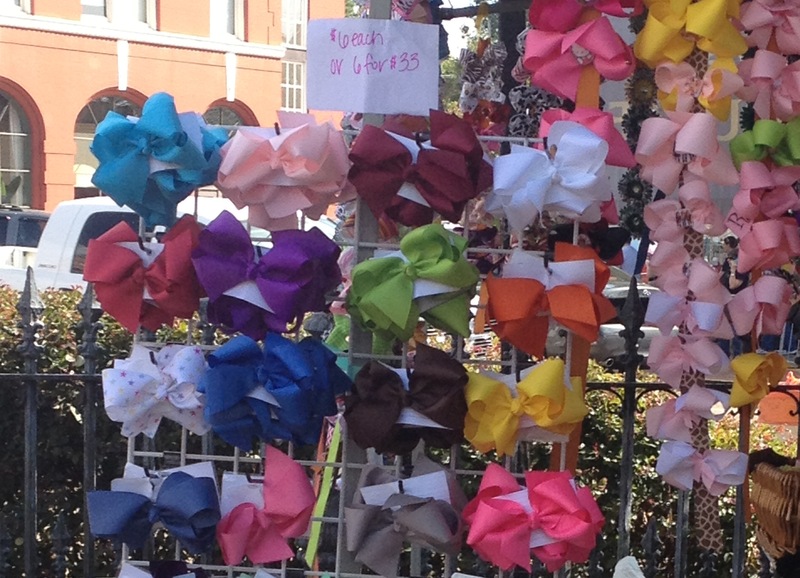 I haven’t run across a “First Baptist Church” hair bow, but that doesn’t mean one doesn’t exist. How does one wear a hair bow? As far as I can tell, anything goes. My mom was always partial to the top of my head, but plenty of folks wear them on the side or the back. With ponytail or without. Straight hair, naturally curly, or permed. You’ll even find bows attached to headbands for hair-challenged kids. Braids? Ringlets? Sure, why not? Some might suggest they ought not be worn with dreadlocks, but that’s likely a moot point. A dyed-in-the-wool bowhead might persist in embellishing her hairdo with ribbons up until such time as she eats her last chicken salad sandwich. I believe most folks retire the hair bows early in their 20s. Perhaps it’s a rite of passage when one finishes college, gets married, has a kid or all of the above. There’s no law in place, but I’d suggest that hair bows be confiscated from anyone with gray hair or grandkids, whichever comes first. Call me ageist if you like, but I, myself, fit into one of those categories. Have you ever worn hair bows? If and when did you stop? Extra credit bonus question: Why? Photo credits: Canton Flea Market bows and Portrait of a Young Bowhead from Holloway Family Archives. All other bows available at ETSY–Colorful Bow by NothingLikeBOWS, Monogram Bow by Prettyloulou, MS State Bow by BiancasBoutiqueBows, and John Deere Bow by PolkaDotzBowtique. ← 130. Dixie-Style Party Food: Dip it Good! That’s hilarious!! Who says folks can’t be fashionable and sporty at the same time? Three cheers for your daughter!! I’m sure that bow you saw in Seattle was mine. Every summer we come “home” for a month in the summer from Virginia, with a separate suitcase just for hair bows and accessories. Joking, sort of. There is nothing I like more than seeing my 5-yr-old tearing around the park, hair flying, bow bouncing. I just love ’em. Every third shop in my town has a rack of bows like yours pictured, but I like making them myself. No embellishments, close-as-possible match. Hey Elizabeth, next time I see a 5-year old with a bow here, I’ll be sure to wave! Love the thought of an extra suitcase just for hair accessories! Wow. I’ve never worn bows. But then, my hair is not long enough to support some of those pictured. That’s funny, Betty! Some of those bows are a bit overwhelming! My son used to differentiate his grandmothers by calling them, “The one with the bow” (southern) and, “The one with no bow” (northern). It was an age-approved low and smallish bow that matched her outfits, of course. That’s hilarious, Hope! Love the thought of telling relatives apart by their accessories! I’d almost forgotten about those ginormous bows, Kim! My niece always wore one, sitting directly atop her head, even when she barely had hair right after she was born! You sure don’t see much of that in the Midwest. Debbie, I bet your niece looked just darling, with or without hair!